Do you have a particularly excellent pickled green tomato recipe? I you do and you'd be willing to share it, I'd be most grateful! Well, let's try this Romanian way to do. Please excuse my language mistakes. Brine preparation: Use 1 tablespoon coarse salt peak. for every 4 1/4 cups (1 liter) water. Boil water together with salt. Take care of salt concentration. C. Flavours and colors thyme, dill, garlic, horseradish (sliced by length), celery leaves, black pepper, bay leaves. Horseradish is very important, it is a must. The rest according to your taste. Arange tomatoes in the jar(s). Put flavor and color ingredients through them. Jar ends with a shoulder. Finally put under this shoulder crossed horseradish (sliced by length) to fix the tomatoes. After brine is ready, let it 2-3 minutes and then put it (hot) over tomatoes. Tomatoes must be covered by brine and crossed horseradish slices will keep tomatoes in immersion. Next day add more brine (if necessary), put the lid and store jars in cool conditions. 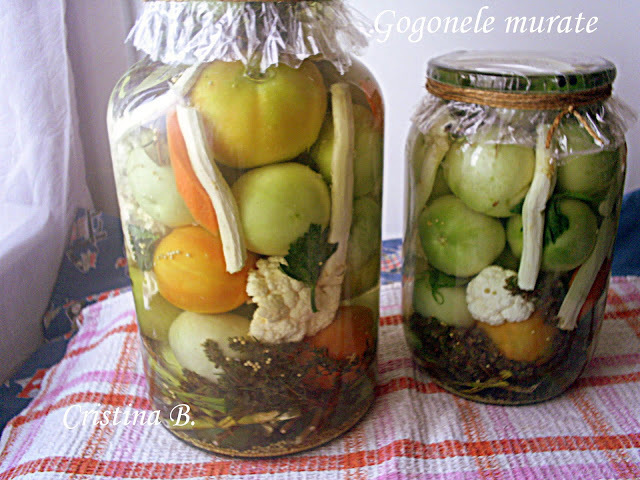 This kind of pickled tomatoes are rich in vitamin C, they are good for digestion and immune system, but they are forbidden to those with severe kidney disease or those with hypertension. Last edited by Moshou; October 15, 2012 at 01:56 AM.